For today, it’s a series of inquiries from Greg, who wants to know more about the cost disparity in Eclipse between Wizard and Sorcerer spellcasting. This is a followup to this article, and will make more sense if you read that one first. Since that involves a lot of information about why various rules and costs in Eclipse are the way they are, that seems a worthwhile topic to examine in depth, starting with spell caster levels and the cost disparity between the various types – especially Wizards and Sorcerers. First I agree that back compatibility is necessary when the aim is to stay within the rules boundaries of the d20 systems, otherwise you might as well design a whole new game system. I also agree with hand-waving 0-level spells as they are largely useless in combat beyond 2nd level. If you have generic worries, the rules on building spellcasters are further discussed over HERE. Number of Spells known. From your response it seems as though you are saying a wizard will only ever have a maximum of 41+Int number of spells (not counting cantrips). This is simply not true. This is in fact the *minimum* number of spells a 20th level wizard will have recorded in his spellbook. Pages 178-179 in the 3.5 Player’s Handbook confirm this. In fact a Wizard, not a Sorcerer, is free to develop spells through research, and thus has no true limit to the number spells they can record. The only limit they face at this endeavor is money and time. First up, the next few paragraphs in the original response after that bit of math discuss how Wizards (AND Sorcerers) can get more spells. That’s why the note as to the “basic” wizard. Now, Wizards can spend time and money to acquire spells through a vulnerable device – a spellbook. Sorcerers can spend money to acquire spells though a vulnerable device – a runestave (or, in Eclipse, through devices in various other forms). The Wizards only limits are money and time – but the Sorcerer’s only limit is money, since they’re paying for other people to spend the time. Secondly, even in the basic rules, Sorcerers are free to research new spells; they simply can’t add them to their spell list until they have an open slot. In Eclipse, of course, Sorcerers don’t actually need to research new spells. The “Studies” limitation on arcane magic says that “Spells must be found and mastered, or the user is limited to a modest list of inherent spells”. It doesn’t say anything about them being restricted to spells from a particular source, or having to research unusual ones if they want to fill their inherent slots with them. As with every other form of inherent spellcasting in Eclipse, Sorcerers are perfectly free to fill their list of spells known with unique creations. Practical Spell casting. Sorcerers can cast more spells during one day than a Wizard. The table clearly shows this. In many cases the Sorcerer does have some degree of flexibility over the Wizard in that he can cast the same spell numerous times with the need to prepare ahead of time. However the Wizard has some options that a Sorcerer does not. Primary among them is what I term Utility spells. Wizards by and large will have far more mundane Utility spells than a Sorcerer because they can afford to have them. With the horribly low number of spells Sorcerer can know, no Sorcerer will expend his precious spell slots on Utility spells that don’t have a historically large use in their GM’s campaigns. A Wizard on the other hand is free to scribe that “useless” spell into his book on the off chance it may come in handy one day. Also it seems that you missed that a Wizard can leave any number of spell slots ‘open’ when preparing his spells (pg. 178 PHB, Spell Selection and Preparation). This allows the Wizard to look-up his handy Utility spell and cast it when needed. Granted it will take him 15 minutes to prepare the spell and is not an option that will always be available, but it is still there. That the wizard does not have to be cautious with his spellbook, and will have his full collection of spellbooks along rather than a much more limited – and cheaper – one (I take it you have never heard of a “Traveling Spell Book”?). That additional spells are readily available in the setting. 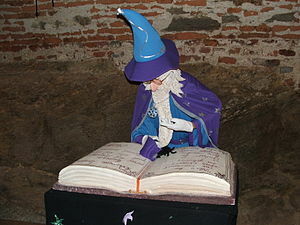 Remember, the suggested minimum fee in the core rules for simply being allowed to look at another wizards spell formula is 50 GP per level of the spell, with the note that higher level spells often command far higher fees – IF you can find other wizards who are willing to let you look at their precious spell books at all. What if wizards are rare, and so are arcane scrolls and spell formula? That the Wizard will have time to prepare utility spells. That the Sorcerer is not investing in feats or items to expand his or her own spell repertoire, such as Hedge Magic from The Practical Enchanter. That the Sorcerer has not simply spent a higher-level spell slot on a broadly useful spell, since a Sorcerer can afford to burn a higher level spell slot to obtain flexibility. That the Sorcerer is not investing in magic-enhancing items of his or her own. All of those are poor assumptions. Yes, a wizard is quite free to scribe random spells into their books – if they want to spend the one day and 100 GP per spell level (with level zero spells taking up 1 page and 100 GP). Have you ever added up the cost of a wizards spellbook? Even just counting the cantrips from the Players Handbook? A first level wizard’s spellbook costs a bare minimum of 2200 GP, +100 GP per point of the Wizards Int Modifier. The resale value is half of that. Knock that first level Wizard over the head, steal his spellbook, and re-equip your entire first-level party? Now we’ve already seen that the difference in the number of spells available between a basic Wizard, limited to the spells they get for free, and a Basic Sorcerer, is fairly small. So to make your more versatile wizard, lets get him or her… two utility spells of each level. That’s not unreasonable is it? OK; that’s 2+4+6+8+10+12+14+16+18 = 90 levels of spells. That’s 9000 GP and eighteen days worth of time in scribing costs, presuming that nothing ever goes wrong. If he’s using captured spellbooks, that’s a share of treasure worth 4500 GP – the same as the standard access fee cost. If he’s using captured scrolls, then the expense is a great deal higher for higher-level spells, since scrolls start cheaper, but multiply the costs by the minimum caster level of the spell. Now, lets presume that – like any wizard who isn’t a COMPLETE idiot – our mage has invested in a backup copy of those spells. That gives us a minimum cost for those utility spells of 18,000 GP and thirty-six days in scribing costs and 4500 GP in access cost – and probably a good deal more; if our wizard is paying fees for access to other peoples spellbooks, we have that higher fee problem, travel and negotiation time, and the problem of finding someone who has the spell you want. If our wizard is relying on captured spellbooks, those often have duplicate spells in them, but those add to their “value” as part of his or her treasure share anyway – and finding someone else to buy them after you copy them is a problem. You know, I bet that Sorcerer can pick up at least one level in that time, and a bunch more treasure, even discounting having that extra 22,500 GP to buy utility magic of his own with. If something ever does happen to our wizards primary spellbook, it’s time to make another backup. Actually, those backup costs are higher; After all, the backup book doesn’t get the benefit of the “free” spells that the first one does; ergo, even a “Basic” Wizard will be spending at least 2200 GP to back up their first level spell book plus – assuming they always get the best spells they can (two more level one spells, four spells of each level of two through eight, and eight level nine spells) for a total of 214 additional levels of spells. That’s a basic scribing cost of 23,600 GP and 57 days. All in all, that’s three entire months of time that our Sorcerer can be out adventuring in while the Wizard is busy scribing and almost 50,000 GP in extra cash to do it with. Being able to pull your new spells out of the air is a VERY big benefit. Even at level twenty, 50,000 GP is a pretty big chunk of cash. There are ways to make this cheaper – but they require taking special options, which you were presuming were not available. As an aside, I have never been in a campaign where a wizards spell book (mine or another players’) was ever destroyed or taken without some means of recovering it. GMs that do this are, in my opinion, simply being spiteful and not creative or mature enough to deal with a problem player/spell in a rational manner. An interesting notion – but one that flies directly in the face of the basic rules, which give us Spell Mastery – a feat so important to wizards that it is (almost uniquely) mentioned in the basic rules for the class it applies to – yet which is pretty much irrelevant if spellbooks are not at risk. Basic d20 also presents us with rules for using borrowed spellbooks, replacing and copying spellbooks, and item saving throws. Those aren’t just decorative. Yes, if you grant a Wizard’s spellbooks script immunity – and thus grant every Wizard the equivalent of ten extra feats or so invested in Spell Mastery – Wizards do look a lot better don’t they? A big stack of free feats will do that for a character. Now I do indeed expect the players to be creative and mature enough to plan ahead and respect the limitations that they’ve selected. A notorious assassin who does not establish covers, alibis, and safehouses, and allows himself to be captured by the authorities may wind up dead – or stuck with a series of missions for which he or she won’t get paid. A bow expert who gets into melee with his or her bow, and gets it sundered, may wind up without a suitable weapon if they didn’t bring a backup – and may have to pay quite a lot to replace it. A Fighter who charges into battle against a rust monster without taking off his or her metal armor may wind up without it and have to pay quite a lot to replace it. A first level character who goes to challenge Vardias the Living Inferno, the ancient red dragon of Ironfang Mountain (said to be built entirely of the armor and personal weapons of the parties of adventurer’s he’s defeated), to a personal duel is ALSO probably going to wind up dead – unless Vardias laughs himself to death or they’ve come up with something incredibly clever. Would you respect a player who then whined about the situation he or she intentionally sought out being an unbalanced encounter? A Paladin who decides to become lawful evil will lose quite a lot of their abilities, and all for a decision that pretty much any other character is allowed to make freely! A character who loses a prerequisite for their prestige class may suddenly wind up without access to a bunch of their abilities. I expect basic Clerics to respect the code of conduct required by their god or to lose access to their spells and class features, just as their class description requires. I expect Druids not to buy metal armor and prohibited weapons and then whine about how unfair it is that they can’t use them without a penalty. And I expect Wizards to plan ahead, and to spend the time, effort, and gold, to protect and back up their precious spell books. If they decide not to do so, despite the fact that the game rules are pretty bluntly telling them that they should, then I expect them to be mature enough to accept that – if something does happen to that spell book – they’re going to have to deal with using borrowed spell books, or even with not being able to renew their spells, until they go and pay for a new book of spells. How is that really different from that archer having to go and pay to get some enchanter to spend months replacing that +3 Flaming Frost bow? None of that has ANYTHING to do with a “problem player or spell”. It has nothing to do with “being spiteful” either. Being wounded, having attributes or levels drained, or having your equipment (whether weapon, armor, item, or spellbook) destroyed, is bothersome, and may be expensive to fix – but it’s a perfectly normal part of the game. In essence, what you’re arguing here is that “my house rules make Wizards far more powerful, so your sourcebook should provide Sorcerers with some bonuses to make up for the benefits that Wizards get in my house rules!”. I’m afraid that making a point-buy system compatible with 3.0, 3.5, Modern, and Future d20 was bad enough. Trying to make it compatible with all existing house rules is somewhat impractical. So what does this mean from my point of view? I do feel that Sorcerers spell-casting is better than a Wizards in terms of availability and instant access to useful spells in combat. As, I said before however, I feel that Sorcerers should get a break in terms of cost due to the limited number of spells they can have. That’s why I presented you with a cost calculation based on deriving the cost of a Sorcerer’s list from the Wizard’s list. I take it that you feel that 40% off is insufficient to make up for the loss of flexibility? I could just as easily argue that +50% is insufficient to make up for the benefits of being a spontaneous caster. Ultimately, if you present some math, I can try to help you with that. I can’t say much about your feelings. That’s why this material is really directed towards anyone who wants an explanation of how and why some of the rules in Eclipse were designed. Now, the costs of the spell progressions are not being “justified” by the rules in Eclipse. They’re set by back-compatibility requirements. Remaining back-compatible required solving a system of simultaneous equations – one for each 3.0, 3.5, Modern, Future, and Prestige class in the system reference document with the minimum cost in the system – one skill point – set to a value of “1″. What you are arguing here is that Wizards of the Coast didn’t give the Sorcerer enough abilities to make them competitive with the Wizard. Unfortunately, that complaint has nothing to do with Eclipse or with Distant Horizons Games. Complaints about the basic d20 Sorcerer design should be addressed to Wizards of the Coast (although you probably are far more likely to get an answer from me). From my point of view, you are trying to justify the costs of the spell progression with a rule within your own book, namely that spell casters can by more spells. If the GM is using the point-buy system only to allow for a classless system but is sticking to the standard spell tables, then this justification falls flat. You also suggest Sorcerers take Fast Learner to gain more spells, but again that is an option that will not always be available and should not be used to justify a higher cost. The basic spell casting should be designed to reflect that. Options are exactly that, options. The core mechanic should be built on the assumption that no options will be used, and the options should be designed to integrate with that core mechanic. I have to point out here that the point costs of the spell progressions are also rules from within Eclipse, even if they are mathematically derived from the SRD – and yes, if you only use half the system, the remainder may show erratic behavior. Pull half the chips out of your computer and it will probably work even less well. And no, I do not suggest that Sorcerers take Fast Learner to learn more spells. I suggest that – if a player is unsatisfied with a particular purchase – they buy something else or modify it. Eclipse includes a great many ways to modify spell progressions, magic in general, or its various other systems. Now, if the game master opts to allow all those new options except the ones to do with modifying spellcasting, then non-spellcasters will have an advantage. That’s the game masters decision, and a perfectly valid one if he or she feels that spellcasting is overpowered or just wants to make it rarer. Eclipse does not have “basic spell casting” or a “core mechanic” other than the basic dice mechanics. The spell progressions are options, the other magic systems are options, the combat abilities are options. The entire book is optional; you can just stick with the core d20 books – which is where the “basic spell casting” you’re referring to comes from. We can’t change that and remain back-compatible – which is why Eclipse includes Hexcraft, Shaping, Ritual Magic, Rune Magic, Thaumaturgy and Dweomer, and Theurgy – magic systems which are free to explore other options since they’re new, and thus don’t have to be compatible with design decisions which often go back to the first edition. What I would like to see, and feel would be more in line with the core d20 mechanic, is the basic spell casting broken down based on total number of spells cast per day and total number of spells available to that caster. In the 3.5 PHB alone, not including cantrips) there are 352 spells on the Sorc/Wiz list (yes I counted), of which a Sorcerer can know less than 10%. If other WotC books are used, the arcane spell list soars over 2,000 spells. What I think would be a fair distribution is one CP cost for the Spells/Day progression of each list independent of the spell list itself. Then a different CP cost for the Caster level that includes the spell list, spontaneous vs. prepared, and in the case of limited casters (Sorcerers and Favored Souls) total spells known. That would allow for wizards, clerics, and druids to cast as many spells per day as a sorcerer, but at an increased cost. Sadly, this notion breaks down on a number of fronts. Eclipse does not restrict itself to WOTC books for spells or other abilities, since they’re a very limited source. In terms of spells alone, third party books present many times the paltry 2000 spells from WOTC – and players are always allowed to come up with new ones. As a practical example, Page 17 in The Practical Enchanter presents 59,520 spells thanks to the joys of factorials and spell templates. The rest of the book presents many, many, more spell templates – for a total of tens of millions of spells. We can’t really use “the number of spells available” in any meaningful way without putting “infinity” into the equation – which makes the other terms fairly meaningless. Now, your proposal for assigning costs to the spell lists is skipping the biggest variable of all – theme. Don’t generally have to do spell research, keep spell books, or acquire spells. They get full access to their entire list of spells instantly upon gaining a new level. Compared to a wizard, they get two more cantrips, one extra spell from each level 1-5, and one less eighth and ninth level spells. Wizards get… exactly one more spell level worth of spells, for a total of 182 spell levels as opposed to the Cleric’s 181. Honestly, that’s pretty close to identical. They both use prepared spells. So Clerics basically get access to equivalent numbers of daily spells and to a lot more spells than any Wizard can ever reasonably expect to have. By your calculations, the costs – and benefits – should be almost identical or even higher for the cleric. So in your proposed system, a Wizard – or Sorcerer, since you feel that a Wizard gets a better deal than a Sorcerer with regard to spells – will be making an even trade to take Clerical spellcasting instead of their own system. But wait! Won’t this make you a second-rate Cleric with inferior armor, weapons, hit dice, and saves? Why yes, yes it will! That doesn’t work – and certainly doesn’t even come close to “the core d20 mechanic”. That’s also why attempting to provide a mechanical calculation for the “value” or a spell list based on those factors always fails. Theme is all-important. “Arcane Magic” is a wider, more flexible, and more powerful theme than “Clerical Magic” – and an otherwise near-identical spell progression chart using it is a lot more useful than one using clerical magic. That’s why you see an example of a thematic spell list – the “Alchemical Hedge Magician” – on page twenty-two. As you can see in the prestige class conversions, characters are quite free to take themes like “assassin spells” or “blackguard spells” with various spell lists. You’re quite free to take the Cleric/Druid progression and fill it with arcane spells. You’ll just have to narrow your theme enough to satisfy the game master. Perhaps you want to build the equivalent of a first-edition illusionist? Narrow down your list to something that’s about as useful as the Clerical list, and go right ahead. You can also, as specified in the rules, Specialize to double the effect of something. Want to be a mad blaster who never runs out of spells that blow things up? Specialize the Sorcerer list in Evocations and double up on the number of spells per day. The trouble is, the number of possible themes and spells is limited only by the imagination of the game master and players. I could devote hundreds of pages to listing themes and tens of thousands to listing possible spells, and still be terribly incomplete. There is, however, an article on the general philosophy of this sort of thing over HERE if you need help with game master judgment calls. Now, you’re already allowed to increase the number of spells on a progression in several different ways, to use Rite of Chi to regain spells you’ve expended, to take Invocation to get bonus spell slots – or slots that can be expended on any spell in a certain theme without having to prepare or acquire that spell first. I do not like that you seem to be forcing the concept of Paths/Metaspells and the Mana system as a “better” alternative to spell casting. It may suit some groups, but not everyone will want it. Sorry, but I’m not trying to “force” anything. I’ve simply shown you three different ways to derive the same result. The Standard Sorcerer Build comes out just fine in Eclipse. Asking that the cost of their spell progression be reduced because you think it’s too high is simply a backdoor method of asking that they get more points to spend elsewhere. In this case, I’ll simply have to tell you “No”. If you want to house-rule it for your own game, that’s fine. If you like, and you ever play in one of my games, I’ll let you have it cheaper if you want to, since you have made an effort here. So far, Eclipse – and the math and predictions about future game design that went into it – have done a nice job. You can accurately build Warlocks, Skill Tricks, the classes from the Book of Nine Swords, and the various classes that WOTC came out with long after Eclipse was published. You can also, just as accurately, build characters from sources as disparate as Green Ronin, Iron Heroes and Pathfinder (as well as many other sources) – also published years after Eclipse. It’s not perfect, there are a few typos, and some builds are a bit odd – but I think remaining forward-compatible with products produced five years after it was is doing fairly well. If you’d like to look at sample characters built with a wide variety of different kinds of magic, there are a lot of them over HERE. I have played a variety of point-buy systems (HERO games), level systems (1st thru 3.5 D&D, Star Wars d20 Mutants & Masterminds 1st ed), and increased cost systems (L5R and 7th Sea). I have seen some flaws in all of them, I have also seen numerous advantages to each system within its own scope and genre. Overall, the level system works best for me in fantasy games. I love the flexibility of point-buy however which is why I picked up Eclipse in the first place. Part of the trouble there is that a LOT of real systems are non-linear. I spent a lot of time in early grades learning basic math. It was useful then, and it’s useful now. I spent about the same amount of time on algebra. Algebra has more advanced concepts and far more powerful mathematical tools. Also useful. In fact, it got used a lot in Eclipse. I spent about the same amount of time on Calculus too. Even more advanced concepts and more powerful mathematical tools than Algebra. Is that linear? No, that’s an example of a progression. For some things it works. For others, it yields less realistic results. Now, if you want to compare games… I did put up a list of the hardcopy games in my collection over HERE. There are many times that many PDF’s of course. If you want to talk about linear versus nonlinear systems, those are addressed in a discussion on skills over HERE. As for the Feats I’ll start with one that stuck out the most to me as being the most overpriced and is easiest to show why; Weapon Focus. In the book, Weapon Focus is listed as being built with Augment Attack. At its base it’s a 3 CP ability. But for some reason there is a note saying the cost is increased to 6 CP because it is assumed the character will use other weapons as well. This is way overpriced. Weapon Focus allows the character to get a +1 bonus to attack rolls with a single type of weapon. You could achieve the same result by purchasing Warcraft (Specialized: One weapon type, Corrupted: does not add to Base Attack) for 2CP. Weapon Specialization is another one that is easy to show. Again it notes the feat was built Augment Attack with the same note about using other weapons. Weapon Specialization grants a +2 bonus to damage with a single weapon type. Under Augment Attack it states that a +1 damage bonus only costs 1CP and a full d6 (average bonus +3.5) costs 3CP. By that logic shouldn’t Weapon Spec cost 2CP? Yes these are two minor points, but it implies that I would need to go through each and every feat and determine of the CP cost is correct. That’s a lot of work, especially once I start including other official D&D sourcebooks. Sadly, this is completely irrelevant. As I pointed out before, the minor appendix-list of Feats in the back is simply a guideline for places to start looking when building such effects. There are often better ways to build each effect that would take up too much room for a minor and unimportant appendix – and you don’t need to (re-) build existing feats at all. Eclipse is back-compatible. If you want to bring in a feat from another source, and the game master approves it, you can just pay 6 CP and add it to your sheet. Why would you want to break them down? It’s a waste of time. Of course, if you’re using Eclipse, you’re usually better off building what you want in the first place, rather than sorting through a mountain of sourcebooks – but the sourcebooks are good for inspiration. Still, if you want a more extensive breakdown on weapon specialization or improving armor, you can look at a full breakdown HERE and HERE. If you want a genuine weapon specialist, you’ll probably also want to look at the Martial Arts section. Augment Attack is, of course, intended for building bonuses that apply in specific, uncommon, situations – such as versus undead. The cost multipliers are there to discourage attempts to buy bonuses that apply all the time on the cheap – such as “versus opponents”. This brings me to probably my biggest hang-up of the whole system. Almost everything in the book feels as if it is based off of a 6 CP ideal. I do not like that. From my gaming experience of over 20+ years with D&D alone, I can say for fact that not all elements of a game system are equal. While reading through the book there were a few points (can’t remember which ones now) where I felt that you were forcing something to fit into the 6CP mold. I would much rather see the system designed from a variable point cost based on how important it is to a central mechanic. To me HERO is a good (if overly complex at times) example of this. In HERO buying one point of extra attack is worth more CP than buying an extra point of Defense. I agree with this idea to an extent. It does make it possible for player’s to achieve truly horrendous Defense scores without GM control, but any point-buy system by default must include GM control to prevent abuse, it’s the nature of the beast. I would be much happier to Eclipse use a similar approach. It does make for a more book keeping, but in my experience it also achieves greater play balance. There are several major reasons for most of the feats and feat-equivalents costing either three or six character points. Back-compatibility. In basic d20, all Feats have the same cost. Ergo, the vast majority of feat-equivalents in Eclipse have to have the same cost. To make it easier for people using the system. Multiplying either three or six by two-thirds, one-half, or one-third is quick and easy and gives nice even numbers. Hero, of course, tends towards base cost increments of five points – and most of the players require either a calculator or a spreadsheet and hours to build a complicated character or a character-generator program. All the math is one of the major complaints about HERO – ergo Eclipse was designed to have less of it. The basic math underlying the system. The solutions to the various class-equations established that the balance-cost of one feat was almost exactly equivalent to six skill points – which, as the smallest purchases in the system, were set to one point. Those same equations established the costs of most of the other powers – and an awful lot of them came out to three or six points. In fact, the total costs are far more varied, since most abilities have multiple optional sub-abilities – but those effects have been intentionally divided up to fit into three or six point segments, so as to keep the math as simple as possible. Rather than fitting the pricing to the ability, the abilities have been fitted to the pricing – which is much easier on the users. If you want a comparison of Eclipse and HERO, there’s one over HERE. Now, what “Central Mechanic” you’re talking about here, I don’t know. The central d20 mechanic is “Roll 1d20 and add your bonuses to see if you beat a difficulty number”. This, however, does not seem to fit with what you mean. More significantly, “how important things are” varies from campaign to campaign – and there’s no way to predict that. If a game only uses magic within the bound of computer games (perhaps you can plug your brain into a computer game, and be a magician within the world of Zelda – but not in reality), those skills aren’t going to be very important. If it’s a diplomatic game of intrigue, then social skills are king. If it does a lot of tunnel-crawling in cramped spaces, area effects are crippled. In a “Barbarians of the North” game, Strength and Constitution are all-important. In a magical academy, fighting skills may be fairly worthless, while Intelligence and magic reigns supreme. In general, Eclipse follows the balance scheme of the original 3.0 and 3.5 rules – which wasn’t perfect, but did get some very extensive playtesting. If you want to examine Play Balance, there are a series of articles on that over here – Part I, Part II, and a Commentary. I hope this helps anyone who’s invested the time to read this far! Eclipse: The Codex Persona is available in a Freeware PDF Version, in Print, and in a Paid PDF Version that includes Eclipse II (245 pages of Eclipse races, character and power builds, items, relics, martial arts, and other material) and the web expansion. The Practical Enchanter can be found in a Print Edition (Lulu), an Electronic Edition (RPGNow), and a Shareware Edition (RPGNow). There’s an RPGNow Staff Review too. Good post. I really enjoy the section on Martial arts. I miss the martial arts presented in the Ninja Handbook from second ed. Very detailed, thank you. They do serve a useful purpose in the system. I’m glad you liked the martial arts collection. If you’d care to make your own, Eclipse includes the complete rules for them. Cool. Long post. It was worth the reading time.